Adventurers through and through, no environment is too inhospitable for the Dinobots. In fact, these three tough robots are more at home in the thickest, most poisonous jungles of the galaxy than they are in the comfortable machine cities of Cybertron. When a mission requires animal instincts, sure feet and a laser-proof hide, the Dinobots are the ones to call. 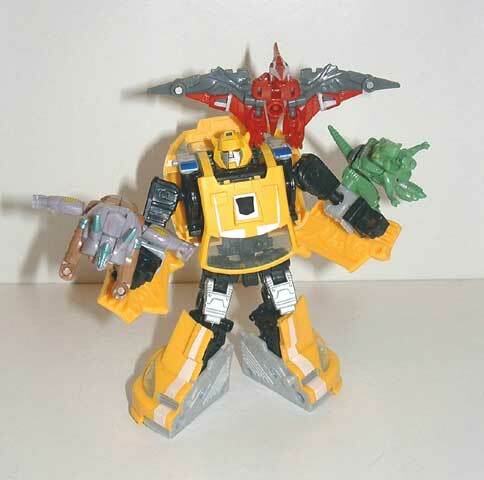 Mini-Cons were a great addition to the Transformers races, and have come a long way since their original inclusion as the gimmick of the Armada line in 2002. These tiny toys unlock features in some Autobot and Decepticon figures, and can be attached to many to increase their power. They also seem to be excluded from the rules governing proportions and standard appearances, leading to the development of many interesting transformations. However, their overexposure in the Armada line led to a level of irritation for many fans, and the Mini-Cons were geared back a few notches for Energon and Cybertron. Still, they were here to stay, and Classics have brought a mini-revival to the third race of Transformers! Of course, this is a bit bizarre, as the majority of Classics figures have no Mini-Con ports, while none are advertised as having any at all! Bumblebee puts this right to an extent, but it does seem a pity that most of the line are incompatible with the Mini-Con teams. Another novelty to the Classics Mini-Cons is faction allegiances. Previously, despite obvious preferences, Mini-Cons were a faction unto themselves, with their own logo. None wore the emblem of either the Autobots or Decepticons. Cybertron aligned Mini-Con teams with factions, but the insignias were still left unprinted. This has all changed with the Classics Mini-Cons. These are solidly aligned with either Decepticon or Autobot, with insignias emblazoned upon their alloy skins. In fact, the Mini-Con logo seems to have been left out from the molding � does this mean Mini-Cons have finally been absorbed into the War and enlisted by the two armies? That aside, the Classics Mini-Con teams seem to be far more experimental in their transformations than any previous line, and have covered a range of vehicles and animals so far. 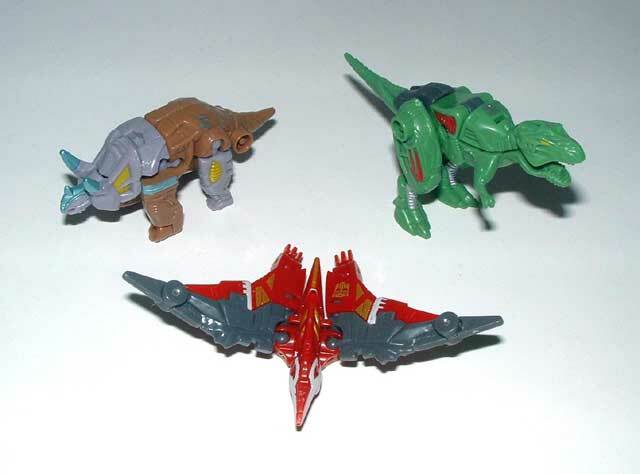 Amongst these are the Dinobots, which turn into extinct archosaurs (two dinosaurs and a pterosaur). They are a clear homage to the G1 Dinobots, which is very interesting at such a tiny scale, and with the inclusion of a Classics Grimlock figure in the Deluxe Class of the line. Only one shares a name with its G1 contemporary (Swoop � G1, Universe, Energon), while another shares its name with a Beast Wars character of very little resemblance (Terrorsaur � Beast Wars, Transmetals, Armada). The final member of the team introduces a new name to Transformers � Knockdown. Terrorsaur jaunts around as what is no doubt meant to be a tyrannosaurus rex. Don�t get me wrong � it is a rather good alternate mode, despite the odd name (which is usually assigned, almost wittily, to Transformers with pterosaur alternate modes). It�s just me being pedantic. I�ve always found it interesting that t-rex is known by the public down to its species name (rex) while other dinosaurs tend to be known by genus (Tyrannosaurus). Why do we never get any toys claiming to be tyrannosaurus bataar (which I think a lot of the Transformers � including this chap � resemble far more)? Anyway, back to the world of Transformers. Detailing is superb on this tiny fellow (3 �� [9cm] nose to tail tip), with loads of molded biological and mechanical touches. It�s a style very similar to the recent Beast Wars 10th Anniversary Megatron figure (or the Cybertron repaint even more-so), and it works very well. The toy is mainly green, with some grey plastic, while red and silver add splashes of colour, and yellow defines the eyes. An Autobot symbol is branded on the dinosaur�s back. Articulation is rather good, with an opening jaw (upper jaw is hinged), moving legs and tail. Balance is also excellent, allowing for a more look in line with contemporary dinosaur theories, or a more traditional one. It seems a pity the wee arms don�t move, but then the angle could not have been reproduced so well on this scale while including articulation. Interestingly, there are two ports for attachment to the Mini-Con ports of other Transformers � one on either hip. Terrorsaur has the simplest transformation of the Dinobot Mini-Con team, but it�s still inventive and fun! The resulting �bot stands around 2 �� (6cm) tall, and keeps the dinosaur legs. This lends a rather faun like feel to the figure, while the asymmetrical nature of the upper body is reminiscent of Beast Wars. The left arm is blessed with added articulation with the beast mode�s upper jaw, while the left arm features, erm, little legs sticking from the bicep. Luckily, a nicely molded cannon at the end of this bizarre appendage helps counterbalance this. The head is rather similar to some of the upcoming Movie designs, while still keeping a definable nose and eyes. The silver lower face and red eyes are both applied perfectly (which makes you wonder why they couldn�t paint Classics Starscream�s eyes on neatly�). Alas, due to the careful design of the beast mode, the centre of gravity is very restricted on the robot, restricting poseability despite the fantastic shoulder articulation and the possibilities this presents. Still, both modes are very displayable, and rather unique � but I have a hunch that the dinosaur mode will win out for most of us! Looking at Knockdown, you wonder why he wasn�t named �Slag� (G1 Triceratops Dinobot) or Triceradon (as later Slag incarnations are known, as well as other ostensibly different characters with a Triceratops alternate mode). In any case, Knockdown introduces a new name to Transformers, and is a lovely biomechanical Triceratops while in �disguise�. He�s the bulkiest member of the Dinobot team, and measures 3 �� (7.5cm) in length. Molded detail is beautiful, giving an excellent cybernetic feel (much like a compromise between the stripped down G1 look and fleshed out Beast Wars style). The main colours are pale brown and lilac, while metallic blue and flat yellow pick out some details. There is a silver Autobot insignia branded above the left thigh. As with Terrorsaur, Knockdown possesses a Mini-Con port attachment on either side � this time on the tail base. The intriguing transformation does leave a few strange features, such as the hinges in place of the front feet (although, to give Hasbro credit, toes have been etched), and he does have a long snout reminiscent of the Kenner Jurassic Park (1993) Triceratops toy. But, fair enough, also of the cast of a Triceratops skull (albeit rather flattened) in the Royal Museum of Scotland. Slight weirdness aside, it is an attractive mode, but does lack useful articulation. Knockdown is blessed with the most inventive and complex transformation in the set. It is certainly not intuitive, but is extremely fun (despite the head being a bit fiddly). This transformation gives Knockdown a rather unique robot mode. Standing 2 �� (6cm) tall, the bulk of the Triceratops mode is certainly carried forward. Detailing is very good, and Knockdown is lucky to have bee given two well sculpted fists. His feet did not fare so well, and give the impression of being on backwards (although this is so as to maintain balance). The colours work well after the anatomical reshuffling, and the Autobot insignia is proudly displayed above the left shoulder. The head sculpt is simple, but nice, with a metallic blue face and perfectly painted red eyes. The only problem with the mode is the odd appearance of the beast mode head as the body. The Triceratops� beak has been folded away, but can still be seen in front of the head through an ugly chest cavity. The remaining two horns are positioned rather unfortunately, and the arms, although a good size, cannot reach past the protuberance. However, in redemption, articulation is good for a Mini-Con (with shoulder ball joints and swiveling hips), and the robot looks fantastic on display. I would be lying if I said it was anything other than Swoop that attracted me to this set (although Knockdown has thoroughly impressed me since). The only non-dinosaur amongst the Dinobots (by widely accepted taxonomical systems / cladistics), Swoop is a Pteranodon (a pterosaur) while in alternate mode, just like his G1 namesake. With a 4� (10cm) wingspan, he is a handsome figure while in this mode, well detailed in the same style as his team-mates, and coloured red, gold, white and charcoal. The wings are articulated with ball joints, lending great playability and even the little feat can move on hinges! The beak does open, but doing so reveals the robot mode face at the back of the neck. Simple hinge joints for each of the feet allow Swoop to be posed standing, wings out to either side, displaying his underbelly (although I chose to photograph him lying on his stomach, as there is far more painted detail on his back). Swoop has been given a gold Autobot insignia, printed on his left wing, and has just one Mini-Con attachment port. This is on his underside, and can allow for some fun displays � such as perched on Classics Bumblebee�s arm (a travesty of scale�)! Being a Mini-Con, Swoop has been freed from conventional transformation restrictions in this incarnation, and is great fun! His posture is rather off as well, and you do have to squint down to see the simple elongate face and its tiny blue eyes. He also lacks hands, unless you wish to shorten his arms and use the pterosaur�s feet (which does not look too bad � almost deliberate, with the Autobot insignia on the shoulder�). Arm articulation, at least, is very good � but the legs and neck are rigid. To be honest, there doesn�t seem to be a lot to recommend this mode. However, it is actually rather fun to look at, and to transform, despite its obvious failings. It is a bold and inventive design, which has not totally missed the mark. Transformation: 9 � The three are rather inventive and fun, with Knockdown especially so. Durability: 8 � They all seem rather solid, with many parts being detachable. The only worries are Knockdown�s spindly robot legs, and the fact that Swoop�s robot mode nose is rubbed every time you transform him. Fun: 7 � They are good fun, and kids will love them even if they can�t transform them. However, they may be a little too weird for some collectors� tastes. Price: 7 � I always feel Mini-Con teams are overpriced at over �6 (replace pound sign for dollar sign for US prices�) shelf price. Still, these guys are worth the money if you like dinosaurs, Dinobots, wee Transformers or novel transformations. As I�m a fan of all of the above, they are definitely worth the standard price � however, most online stores are capitalising on these figures and selling at an undeserved premium. Overall: 7 � This is a fun set if you fall into any of the aforementioned categories, and worth picking up if you come across them in a store. However, they are not worth the online prices.